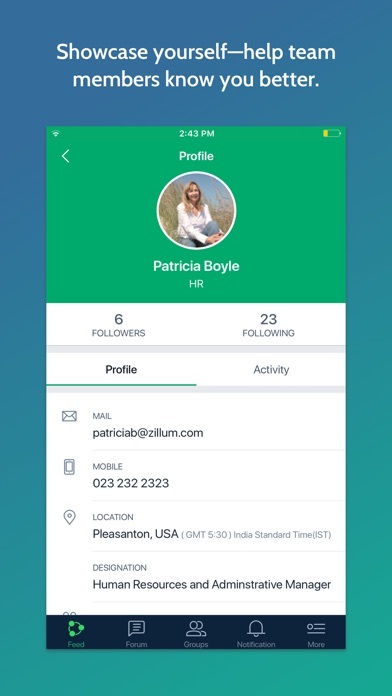 Description To make team work more pleasant, we've changed a few things about our app. With a fresh UI, and some cool new features, here's how you can benefit from our new app: Let ideas flow freely. 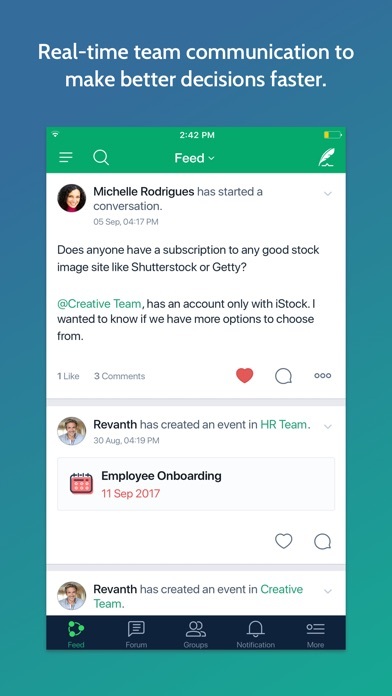 Start conversations with co-workers, @mention users or groups, like, comment, share, and follow posts, or start a poll and get to know what your team thinks. Streamline workplace communication. Organize teams into groups, discuss and share ideas in real-time, and work together. You can create groups based on departments, projects, or to discuss common topics. Instant Communication, better decisions. In this fast-paced world, decisions are extremely time-sensitive. Use Channels to create a team chat and pool perspectives to decide the line of action faster. Centralized archive of shared knowledge. Manuals are designed to help you build a searchable knowledge base that your team can draw from when needed. Using our app, you can access all your Manuals and start conversations around them. Participate in company level discussions. Access your workplace forum discussions, and share your thoughts on them. Follow categories or posts that pique your interest and stay current on the discussions they generate. Teamwork on the right track. For work that involves your entire team, or to maintain your personal to-do list, create a board—a simple tool to help your organize work. Divide your work plan into sections, and add or assign tasks under each section. 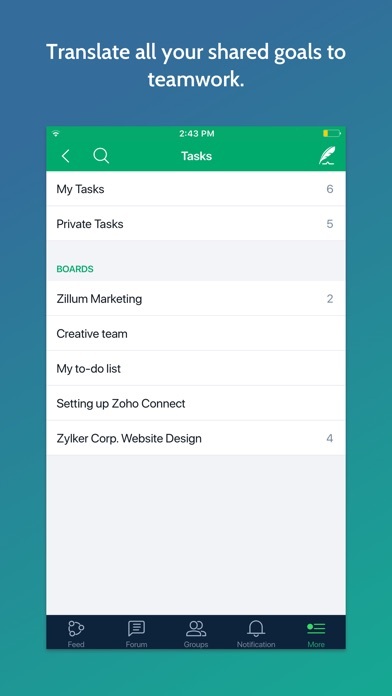 You can also assign tasks to individual members privately outside of a board. Carry an updated schedule. From your personal appointments, to team meetings, to the office ping-pong tournament, create events in our calendar and invite your team. Stay informed, always. With real-time notifications from Zoho Connect, you will never miss anything important at your workplace. Find what you need when you need it. An old post you vaguely remember, or a forum discussion—easily retrieve anything you need by using our advanced search options. In addition to this, you can access all of your custom apps. Every time when I try to create a task, The app just freezes and get stuck. I have to reboot it again. Great opportunity for mm crypto newbie. Thank for your supporting to mm newbies. So far not a good start. Just started using it for the hospital I work for. Downloaded the app, went to change my profile, and it starts to load for 2 seconds and then disappears. Guess you can’t change your profile in this app. When I compare this apps condition last year, it has definitely improved. If you haven’t checked it recently, you should log back in. However, there are definitely some annoyances they have refused to fix for a long time: - Top of the list: forced Portrait Orientation. Many, many iOS devices are connected to keyboards and cases where they cannot be easily rotated, but this app forces you to. Therefore, I usually refuse to open this app anymore on iPads. This app used to support Landscape but they removed it. I’ve talked with the developers and they said they might put it back in someday, but no change in this since last year (2017). - Notification problems: Notifications frequently don’t work. Don’t depend on getting them... you’ll be forced to check the app constantly to make sure you didn’t miss anything. (Extra info for product manager: When people post to their feeds, you get no notification about this even if you are following them. 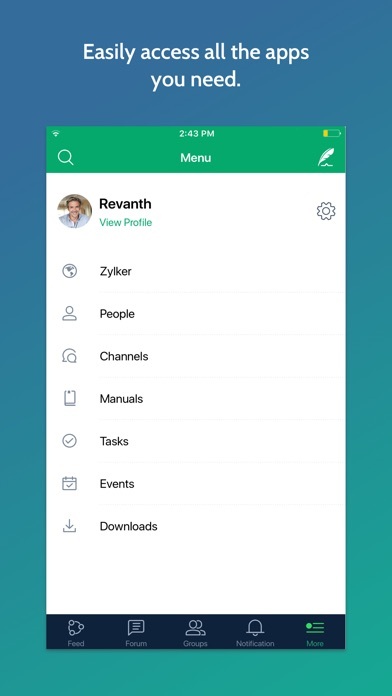 The only way you’ll see it is if you go into the app and check your “My Feed.” We are only getting notifications for posts to the Company feed.) 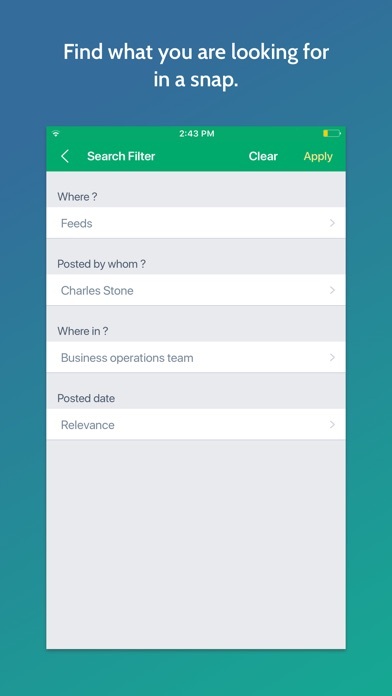 - Limitations in post visibility in your feed: (Extra info for product manager: I’ve already created a support request with you about this previously, but summary:) Items from people you’re following disappear from your “My Feed” after a certain period of time... 30 days if I remember correctly. Once it’s gone, the only way to find it again is to visit the individual feed for each user and scroll backwards. Not user-friendly. I should be able to keep scrolling backward in my feed to see the history that appeared there before. Also, I might not remember who exactly posted it after a month has passed. Things have improved somewhat (problems loading images have been fixed and some formatting issues are better) but more is needed. Unfortunately, some of our users have abandoned this app and I’m not going to try to get them back until there are improvements. This app would potentially be useful if you were even able to sign in. The button is broken, so this app is basically useless. Please fix. This update doesn't let me scroll down. I can't even get this current version to open. Every time I launch the app it force closes.